Trilby Hats are making a comeback as more celebrities wear them. They come in different styles and designs you can find the right one that suits your needs. Everyone can have a piece of their own unisex fedora added to their wardrobe. Pulling off a chic and classic look may be a hard task for many. However, with Stingy, Trilby Hats, this hard task has become easy. 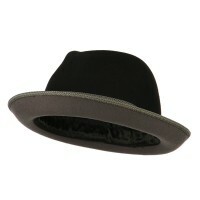 These British-style Fedoras hats feature a soft felt material with a narrow brim and crown with two indents. This is an iconic look and easily stands out from any other hat. These hats have been viewed as “the rich man’s hat” and for good reason: they offer a smooth, polished look for any outfit. Trilby hats have been around since the 1890’s and have recently seen resurgence in popularity. These hats can easily be worn to pull off a retro or vintage style look. Trilby hats can be found with a band and a bow or a feather, on the left side of the crown. The “rich man’s hat” has stood the test of time and can now be worn by virtually anyone. Though they’ve been around for over a century, these hats will continue to be worn due to their classy appearance. Trilby Fedora Hats are in vogue as more celebrities are wearing this particular hat. This stylish hat does not only complement your outfit but also provide adequate protection from the different elements of the weather thus making it very convenient. You can never go wrong with the classic Bowler Hats. Designed for men, it is made from 100% wool thus they provide extra warmth to your head aside from protection against the elements. It is best worn with a coat during colder months. If it is casual appeal that you are looking for, the Youth Striped Band Fedora is perfect for you. It is made from straw and is available in light colors. It provides a perfect accent to your casual attire. In fact, you can wear it with your jeans and tee and you are good to go. Girls, on the other hand, can also own their own Fedora Hats. The Patterned Fedoras are available in bright colors that will surely appeal to all girls of any age. From lovely sundresses to casual jumpsuits, this hat is perfect for different girly attires.